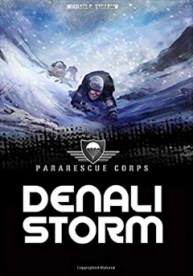 In this exciting new action-packed series from award winning author Michael P. Spradlin follow a team of USAF Pararescue men as they travel the globe on dangerous missions. From the frozen mountainside of Denali, to the Amazon jungle, from the Nile river floodplain to the sands of Afghanistan the PJs go wherever they are needed. Highly trained combat medics and search and rescue commandos, the PJs prepare for any mission anytime, anyplace. With tactics and training the PJs live their motto, ‘These Things We Do, So Others May Live. Two Pave Hawk helicopters cleared the cover of the jagged mountain ridge. The United States Air Force Pararescuemen inside the helicopters were heading for the landing zone at top speed. Three severely injured Marines needed their help. The Pave Hawk choppers were flying on the deck — zooming along close to the ground. They traveled fast with their lights out, trying to avoid being seen. Once the helicopters cleared the ridge, their shapes showed clearly against the night sky. The Taliban fighters saw them, and the shooting started. Enemy fire exploded all around. The Pave Hawk helicopters were supposed to have air support. Either fighter planes or Apache attack helicopters could help keep them safe. But support had not shown up yet. Things happened. Delays. Operational issues. Perhaps the support aircraft were engaged with the enemy further up the valley. Captain Dave Willis piloted one of the Pave Hawks. He’d been piloting Pave Hawk’s for ten years. He approached everything with intensity. His dark eyes poured over the valley before them. Looking for a safe route. “Base this is Pedro One,” said Willis. “I need an ETA on that air support. Please inform them sooner would be better than later.” He squirmed in his seat awaiting a response. This was not the news Willis wanted to hear. Eight minutes would be an eternity in enemy territory. Bullets pinged off the side of the helicopter. Pedro One climbed in altitude. Willis knew they needed to get away from enemy fire until help showed up. Captain Willis turned his attention to his companion Pave Hawk. Each time a pararescue team went out on a mission there were at least two Pave Hawks. One went in to pick up the wounded. The other hovered to provide cover for the chopper on the ground. Then the first chopper would lift off with the wounded and provide cover for the second Pave Hawk to pick up more wounded, if necessary. “It might have come up,” Willis said. “We won’t last eight minutes,” Singer said. “That’s what I told base,” Willis said. “Mako, you guys ready?” Willis asked. “We are one minute out. I can’t get ground contact. Radios are probably being jammed. Can’t verify if the LZ is secure,” Willis said. Mako was Chief Master Sergeant Gregory “Mako” Marks. He would lead the extraction team. Along with his two other PJs, Airman Ahmad “Bash” Bashir and Phil Smith. “We’ll fast rope in, if we have too. We’ve got two Cat Alphas,” Mako replied. Category Alphas—Cat Alphas for short—were the most serious type of injury. A single Cat Alpha meant trouble. Two Cat Alphas were way worse. Cat Alphas were usually some type of severe wound like head trauma or other serious conditions. Patients with these injuries needed medical attention. They needed it fast. The Golden Hour started as soon as the call sounded at their forward operating base. Once the PJs scrambled to the chopper, every second counted. The pararescuemen were 13 minutes into the Golden Hour. The patients’ chances of survival improved dramatically if they could return to the base hospital within an hour. Any longer than that, the chances of more serious injury or death increased. Mako sat back in his seat. Small arms fire pinged off the sides of the Pave Hawk. It was not a heavily armored helicopter. For search and rescue they needed speed and agility. Armor slowed them down. Extra weight might also prevent them from flying at higher altitudes. They needed to reach the injured Marines quickly. “RPG inbound!” Willis shouted through the radio. Mako glanced out the side door of the Pave Hawk, spotting the stream of fire from a rocket-propelled grenade headed directly at them. Time slowed down. Mako could hear his heart beat. He felt his eyes blink. The sound of blood rushing through his veins roared in his ears. Willis’ voice sounded distant to Mako, like he was yelling into a tunnel. Mako heard the pop, pop, pop, sound of flares launched from the Pave Hawk. The flares were superheated. A heat-seeking missile might turn toward one of the flares instead of the chopper. Mako, Bashir, and Smith were strapped into their seats. Their bodies jerked against their restraints as the chopper banked hard to the right. Willis must have given an order to return fire because both Pave Hawk machine guns were shooting at the spot where the missile launched. The .50 caliber noise only contributed to the confusion. Mako could not take his eyes off the missile screaming their way. His breath came in short gasps. Bashir and Smith closed their eyes. The missile seemed to take forever to reach them. “I will not die like this,” Mako muttered to himself. He raised his M-4 rifle, flipped it to full auto, and fired at the incoming missile. It only took seconds to empty the entire clip of thirty rounds of ammunition. Mako’s shooting had no effect. The Pave Hawk flew at such a steep angle of descent that a sudden crash seemed likely. Without warning, the chopper righted itself. The PJs lurched against the restraints again. “We didn’t explode,” Mako said in disbelief. “No, we didn’t,” Willis said. Mako could hear the relief in the pilot’s voice. Mako was one of the most fearless men they’d ever seen. He was always cool and collected on a mission. This was their first deployment to Afghanistan. Mako, ten years a PJ, had been in country four times. Sometimes it seemed like nothing rattled him. Down below the PJs could see a cluster of Marine vehicles. It was dark, but the occasional muzzle flashes from automatic weapons lit up the night. They were taking fire. It looked like they were surrounded. “Put us down,” Mako said. “We’ll fast rope down,” Mako said. Sometimes the LZ was not secure for a landing. In this case, PJs would rappel from hovering choppers. It was dangerous but occasionally necessary. “Lieutenant? Are you listening?” Mako said. “I’m here Mako,” said Lieutenant Jamal Jenkins. 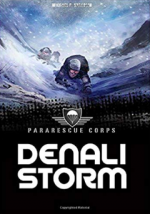 Jenkins was Mako’s Combat Rescue Officer, or CRO. He was back at the forward operating base, helping coordinate the mission. Mako pounded his fist against the side of the Pave Hawk. They needed to get to those injured Marines. Somehow. Some way. “Lieutenant! We have—“ three thunderous explosions cut off Mako’s words. The noise came from the area beyond the landing zone, from where the Marines were taking fire. The night sky glowed orange as flames shot upward. Three other explosions soon followed. The ground near where the Marines were pinned down turned into balls of yellow and blue light. The Apache air support arrived. They came in with cannons firing and missiles sizzling through the air. With six missiles, they wiped out the entire Taliban resistance. “Hooyah!” the Pave Hawk crew shouted. Without another word, Willis floated the chopper in like a dragonfly. When the chopper landed deftly on the ground, Mako checked his watch. Twenty-nine minutes into the Golden Hour. They were going to make it. Mako unhooked his harness. He sprinted toward the wounded men.